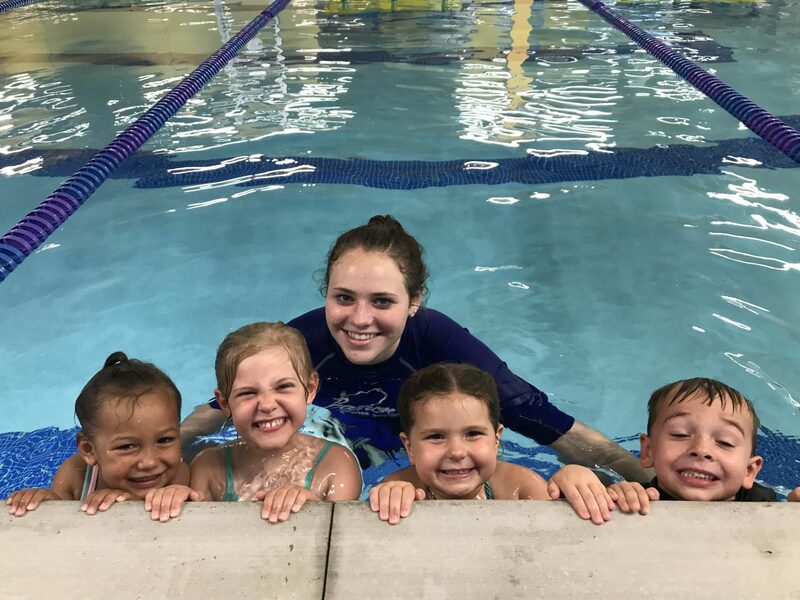 A big part of our curriculum deals with water safety and teaching particular skills, which will help a child, stay safe if they encounter a troubling situation in and around water. One of the things we spend a great deal of time on in our program is safety circles. These skills and progressions are taught in every level of our program from Parent and Tot through Advanced. We feel it is so important to stress to all of you why we do it and the progressions used to teach it. Would your child know what to do if he or she was accidently pushed into a pool, fell of a dock at a lake, or fell off a boat? Panic would initially set in. We believe what has been drilled into them through our program would take over and they could get back to the side of the pool, back to the dock, or back to the boat. In addition, if they could not they would know how to rollover onto their backs and float. A child sits on the side of the pool is cued 1-2-3 and the parent and or teacher pulls them into the pool turns them back towards the wall and helps them to the wall where they will grab on to it and pull themselves out of the water, elbow – elbow – knee – knee. Once a child is able to move themselves in the water, the above skill is performed with the only difference is they turn around and return to the wall on their own. Once a child is proficient at moving themselves in the water, they STAND UP are cued 1-2-3 and jump into the water turn around and return to the wall and make a safe exit as explained above. The final step in the progression is the Polar Barron Float. Children begin in a standing position, are cued 1-2-3 to jump in, come up turn over onto their backs, float for a ten count and return to the wall and perform a safe exit. You may ask why the kids spend a lot of time jumping into the pool. Sure, it can be a fun activity for them, but we also explain to them the importance of mastering these skills. We hope this helps you further understand why we do what we do at the Barron Swim School.